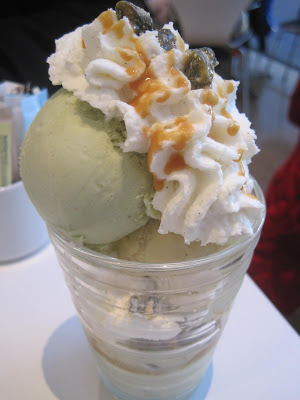 Pistachio Sundae. Sigh. THIS was outstanding. The salty/sweet pistachios had a wonderful crunch to them. We quickly ate up the ones on top, and were delighted to find many more strewn throughout the sundae. 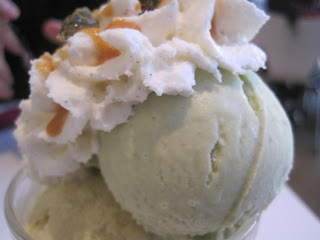 The pistachio ice cream was subtly and deliciously flavored, and smooth as silk, and the vanilla was super smooth as well. At the very bottom of the glass, we found a still slightly-crunchy vanilla biscuit (cookie ;). 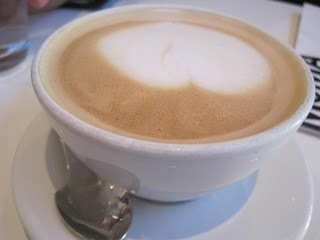 We also had coffee--regular coffee for me, 3 bucks and quite strong, while ABF had a latte, which was quite pretty. I appreciate that they take the time to heat and foam the milk for even drip coffee! 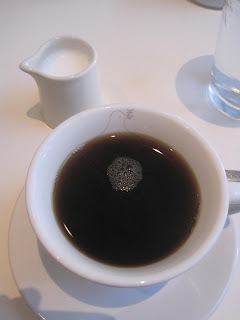 After we'd finished our coffee, our server came by and cheerily filled up both our cups (no extra charge!) A free refill policy anywhere is always a noteworthy event in NYC. The service was also attentive and welcoming--we didn't feel rushed at all. We left feeling satisfied but not overly-stuffed, and we carried on for a few more hours in the museum after that. Later, we joked about going back to MOMA just for that sundae. But I'm pretty sure neither one of us was joking. 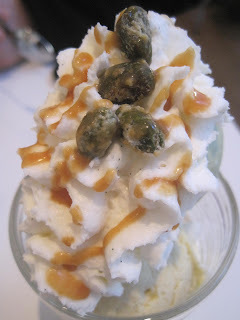 The pistachio/vanilla sundae was incredible. LKP left out the part about the girl sitting next to us ogling it and saying how much she wanted one and her idiot boyfriend ordered the sorbet - what a dope.